The most prominent visual feature of your home is often the garage door. So it makes sense to choose our stunning range of tilt doors, because it is the ideal combination of strength, security and aesthetic appeal. A lot of older garages can be quite limited in terms of space. 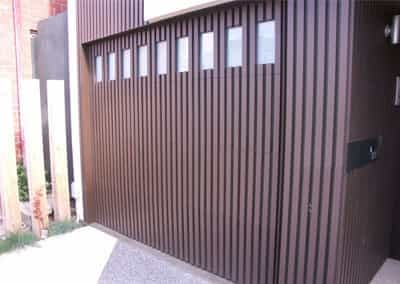 If your garage is not large enough to accommodate a roller door or a sectional garage door, it may be time to look at installing a tilt garage door. Steel-Line tilt garage doors offer the perfect solution for smaller garages or spaces with restricted side or head room, without compromising on style. As the garage door is often the most prominent feature of your home or building, it is important to choose one that is functional and practical for your specific needs while complementing the design and overall appearance of your home. Steel-Line tilt garage doors are fast-opening and easy to operate. Manufactured to fit most garage openings, and easily installed, this product offers safety, security and convenience. Available in a wide range of exciting Dulux® and Colorbond® colours, our tilt garage doors bring a sleek and modern look to your home. As tilt doors are commonly used in private garages on residential homes and units, elements such as ventilation, durability, security and appearance are important. In a world full of options, we have strived to meet all possible needs with a diverse and original product range that covers all bases for our customers. Please fill up the contact form below. We will contact you as soon as possible. To receive the latest updates from Steel-Line please subscribe to our customer database. Don’t worry, we hate spam as much as you do. We will only send offers for products and services that may be of interest to you, but always giving you a way to opt out of further offers if you prefer. The tilt garage door provides the largest range of exterior design and finish options for your home. 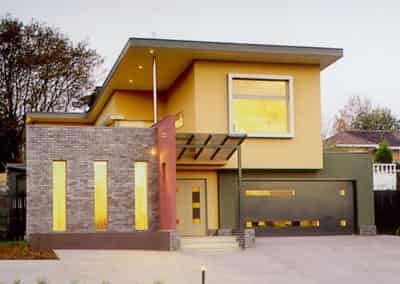 The choice of materials is almost as varied as your imagination allows, and commonly includes plywood and moulding, Western Red Cedar, aluminium composite cladding, and copper sheeting. You can even add windows and personal access doors to your tilt door. 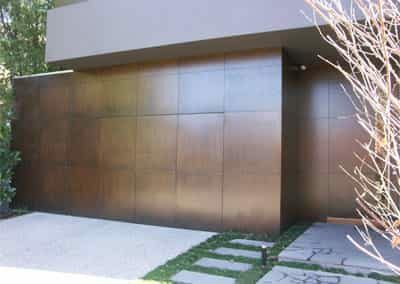 Colorbond® steel – K Panel, Mini Corry, Corrugated etc. The tilt door is built in a single panel and reinforced by an internal steel frame. It opens outwards, on a tilt, swinging upwards until fully open. This allows a tilting-style door to be installed and manufactured to fit spaces of virtually any size. Our tilt doors offer the perfect solution for that specialty appearance up to 2.7m high x 6.5m wide and where garages have restricted side or head room. The maximum weight for tilt doors with cladding is 175 kg. All the tilt doors are individually designed and manufactured to suit the exact size of our client’s garage opening. 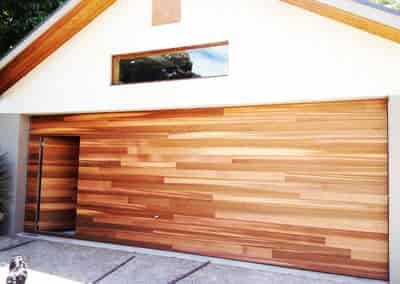 Should floors slope from one side to the other, the door panel can be manufactured to incorporate an angled bottom rail, or taper, to assist in fitting the garage opening precisely and provide the best finish. 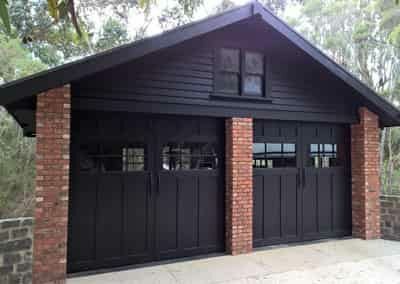 With over 35 years of experience, Steel-Line Garage Doors enjoys a reputation of delivering exceptional service and unsurpassable products to our customers right across Australia. We are at the forefront of innovation in our industry and boast many awards in recognition of our quality craftsmanship. 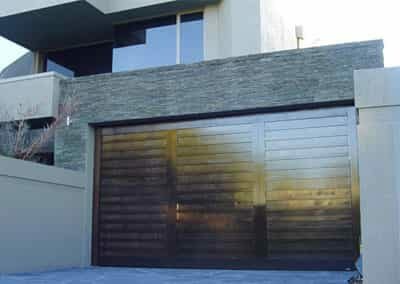 You will enjoy our friendly service and wide choice of garage door designs and solutions. Steel-Line has an extensive range of tilt garage doors to suit your requirements. Whether you are lacking space or simply desire a modern and tidy look for your garage, we can provide you with the perfect solution with our variety of stylish tilt garage doors. Call us today on 1300 767 900 or request a Free Measure & Quote. NOTE: Tilt doors may not be available in some regions in Australia. Please check with your local Steel-Line branch regarding availability.